A healthy lemon muffin seemed a bit out of reach. Why, you ask? 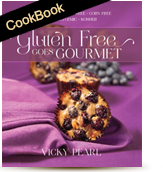 Well, one thing that I have realized is that when developing recipes for gluten-free baked goods, combining the right gluten-free flours is far less of a challenge if you use refined sugar. Refined sugar tends to add the airiness and height that gluten-free flours are unable to provide. I was, however, determined to develop a lemon muffin that wasn’t heavy and still called for raw sugar. I’m happy to report that the resulting muffins are, thank G-d, marvelous. I used almond flour, which is not only a great source of protein, but airier than some other gluten-free flours, and raw organic sugar to help sweeten the mix (You can use it as the whole allowance as well). The children taste testers asked if I could make more! You get the picture!! Now it’s your turn to try these yummy snacks (or dessert or treat) and surround yourself with the same type of applause. 2. Line muffin tins with cupcake papers, or grease a 10” round tube pan. Set aside. 3. In a bowl, stir together the rice and almond flours, potato starch, xanthan gum, baking powder and salt. Set aside. 4. In the bowl of an electric mixer fitted with the whisk attachment, beat the egg whites for 3 minutes or until soft peaks form. 5. Meanwhile, in a third bowl, whisk together the egg yolks, water, lemon and orange juices, sugar, agave, and oil. With the mixer running, gradually pour the egg yolk mixture into the egg white mixture. Beat together for 1 minute or until well combined. 6. Add the dry ingredients and mix for 1 minute or until well combined. 8. 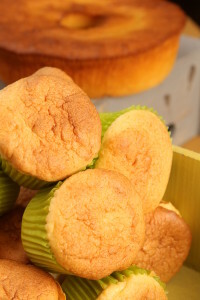 Bake the muffins for about 20 minute or until the tops are slightly golden, and the cake for about 40 minutes or until a toothpick inserted in the center of the cake comes out clean. Remove to a rack to cool. Yield 18 muffins or 1-10” cake.